"A carol, in Old English, means a sun dance. So, consequently, you don't sing a carol, you dance a carol. And so you dance the carol around the tree singing and calling the sun back." Beginning in 1982, my partner Bradley Rose and I began spending our holidays with Harry Hay and John Burnside at their home in Los Angeles, where they regularly hosted a party for fellow faeries and friends on Christmas day. . .
For Harry, Christmas was a time to revisit childhood memories and reconnect with time-honored traditions, both Christian and pre-Christian, of the season. It began with a mad dash on the day before Christmas to find what was inevitably the last Christmas tree on the last Christmas tree lot still open in the city. (This was not for any customary reason other than Harry's procrastination, but it was invariably part of the holiday routine when we were with them.) Set atop a bookcase—the only space in their crowded cottage that could accommodate even a small tree—Harry spent hours applying decorations and tinsel, lovingly and painstakingly. This was a good time, we learned, to leave the house, for Harry took his diminutive Christmas trees quite seriously. Indeed, the only time I ever heard him raise his voice to John was on the occasion of some misapplied garlands. When the cottage on La Cresta Court burned down in the late 1980s, Harry and John were forced to move to an even smaller home where they could no longer host their Christmas soirees. So Brad and I invited them to San Francisco, where they stayed with us on Beideman Street, and Joey Cain made his capacious flat in the Haight available for a party. 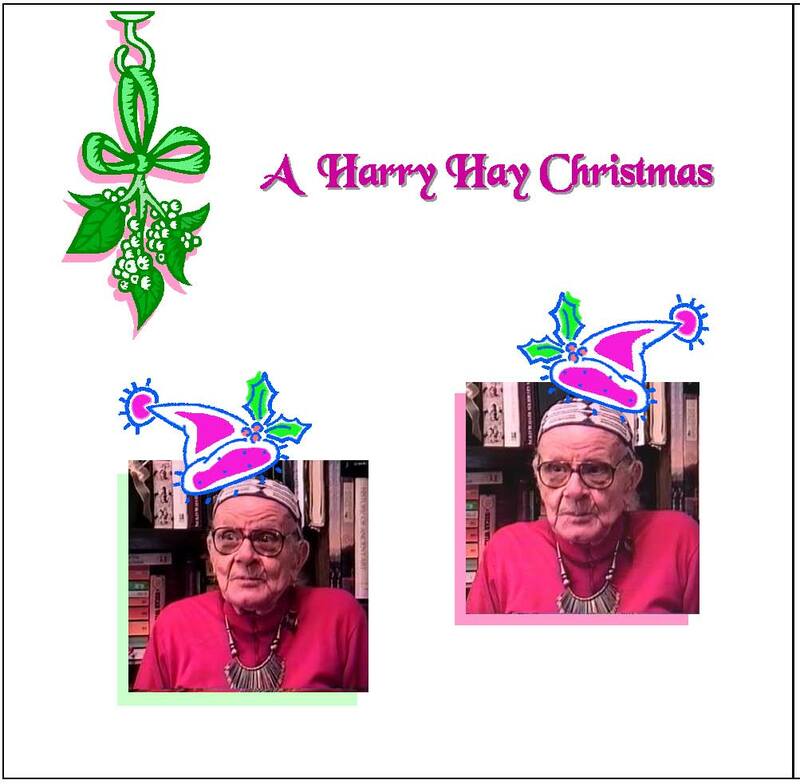 The tradition of Harry Hay Christmases went on. During their stay with us in 1994, it occurred to me to record Harry sharing some of his Christmas stories and remembrances. We sat him down in our book-lined bedroom, and Brad ran the camera while I asked questions; John made comments from the peanut gallery. We taped for nearly 90 minutes while Harry covered everything from the origins of the yuletide log, the bawdy underpinnings of caroling, the folklore of Father Christmas, and his memories of his family's own Christmas celebrations in the 1920s. In the course of his disquisition, Harry recovered a long, forgotten memory of his father, which formed his earliest awareness of his gay sexuality. The clip presented here (please be patient while it loads) includes Harry's account of the solstice customs of Old Europe and parallels to them that he observed while living among the native people of San Juan Pueblo in northern New Mexico.